When Kurt Burnham’s mother was in labor, his father was on the phone telling an assistant how to gently help a Peregrine Falcon chick from its egg. Two weeks later, the two wee ones shared one of their first baby pictures, taken from baby Burnham’s crib–a propitious moment, perhaps, for the now-ornithologist, raptor conservationist, and President and CEO of the High Arctic Institute (HAI). Burnham founded the HAI, a non-profit organization dedicated to the study and conservation of birds in Greenland, in 2007. The HAI continues Peregrine Falcon and Gyrfalcon research started in the early 1970’s by the Greenland Peregrine Falcon Survey. This research began in response to declining Peregrine populations across the globe as a result of the pesticide DDT. In 1974 research efforts transferred to The Peregrine Fund, the organization over which Burnham’s father presided for twenty years. Burnham first visited Greenland with his father as a field assistant in 1991 when he was just fifteen years old. After receiving his Bachelor’s degree in biology in 1997, he began managing The Peregrine Fund’s Greenland Project and became their Director of Arctic Projects in 2003. Following his father’s death in 2006, The Peregrine Fund decided against continuing arctic research efforts. Instead, the organization handed over its small boat and field gear to Burnham, who had recently graduated with a DPhil from Oxford and was keen to absorb the project under his new non-profit, the High Arctic Institute. The HAI monitors Gyrfalcon and Peregrine Falcon populations breeding in the Thule and Kangerlussuaq areas. Relatively small birds of prey, falcons have characteristically pointed wings, talons, and tough flesh-ripping beaks, all good for hunting multitudes of other smaller, tasty little birds. Gyrfalcons, the world’s largest falcon, live across the Northern Hemisphere, but breed only in the Arctic. Peregrine Falcons live in a variety of habitats between the arctic and tropics and are the fastest animals on the planet with vertical hunting dives clocked at more than 200 miles an hour. Rather than building their own nests, falcons tend to take over abandoned nests (especially of Golden Eagles and Ravens) or scrape shallow depressions into rocks on cliff ledges where they lay their eggs. Both species are also very sensitive to environmental changes and are good bio-indicators. Burnham relies on a small, close-knit field team including wildlife biologists Dr. Jeff Johnson (University of North Texas) and Bridger Konkel, and Burnham’s wife, Dr. Jennifer Horwath Burnham (whom he met in Thule), an assistant professor of geography at Augustana College in western Illinois. 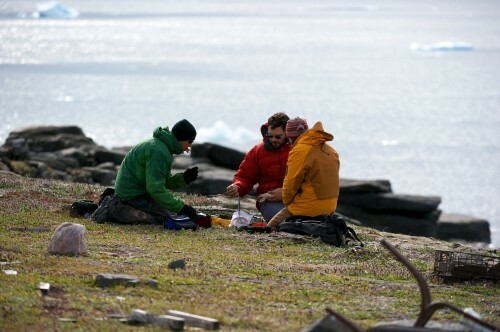 This summer marked Burnham’s twentieth consecutive Greenland field season. Each year in the Thule area, the group visits a number of offshore islands using an open 25-foot boat, often working 24-36 hours at a time to maximize the rare windows of good weather and perpetual summer sunlight. They survey steep, rocky cliffs from the water looking for protected nesting sites on grassy ledges, which they log into a handheld GPS. Next, one or two people repel down the steep cliff face to the nest where, gloveless, they band young while collecting egg shell fragments (pollutant monitoring), blood samples (pollutants and genetics), prey remains (diet), and molted feathers from the adults (genetics). Each summer includes a project particular to the year. Last summer, Burnham’s team spent a month examining the Common Eider population. In other years, they’ve tested for avian influenza for the United States Geological Survey. 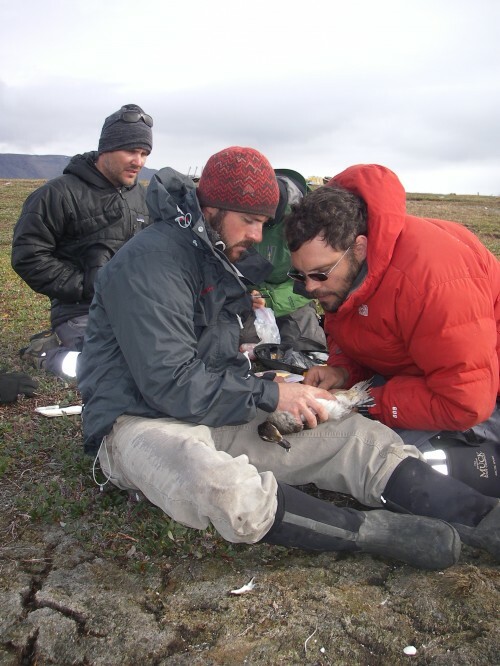 In 2005, satellite telemetry units helped the HAI track birds in three areas of Greenland. 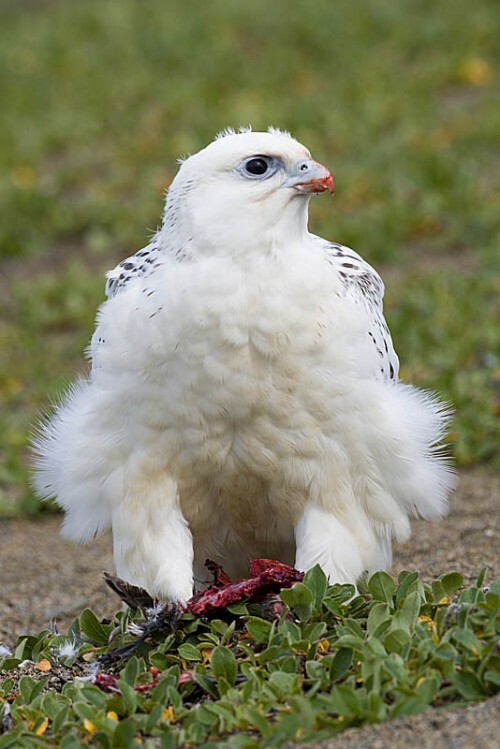 For several years they cored Gyrfalcon nesting sites in Kangerlussuaq and Thule with guano a meter thick for carbon dating, and found one site in Kangerlussuaq that has been occupied for over 2500 years! By returning to nesting sites year after year, Burnham’s team keeps tabs on how Gyrfalcon and Peregrine populations are changing with a warming global climate. As temperatures warm, species of birds that never lived in the Arctic are likely to be moving in. The result will likely be more competition for nesting sites and food since both Gyrfalcons and Peregrines fill a similar ecological niche. It’s too soon to say what the long-term effects of this ecological contest will be, but Burnham’s team will be watching.